Mark your agendas: the 1st Workshop of the PRE-LEAP-RE H2020, will take place in first week of December in Brussels. The event targets our stakeholders with the aim of encouraging them to express their commitment to long-term collaboration and effective innovation in the field of renewable energy. The project PRE-LEAP-RE is pleased to invite you to the first strategic workshop in Brussels on Thursday, 6 and Friday, 7 December 2018. The workshop is hosted by the PRE-LEAP-RE partner EIT InnoEnergy |EU Business Unit situated at 7 Rue Guimard 1000 Bruxelles, Belgium. 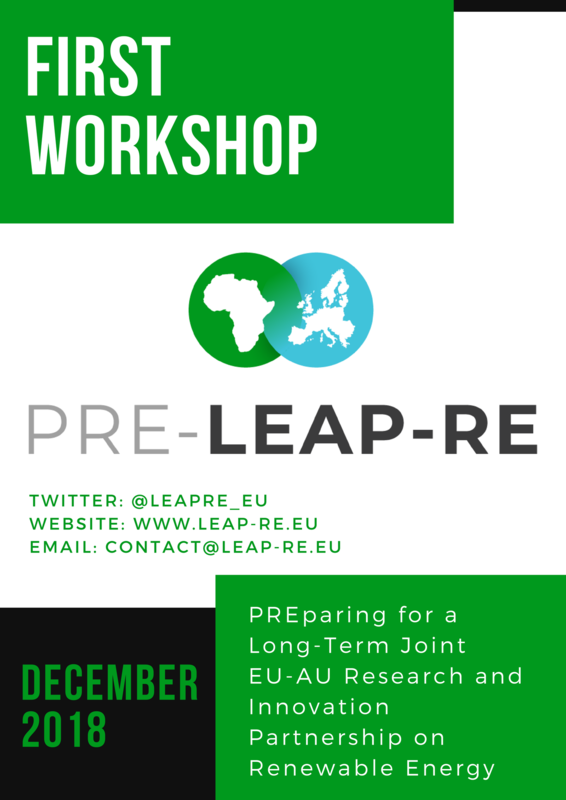 PRE-LEAP-RE is a project funded by the European Union and will prepare, with African and European partners, a joint programme for research in the area of renewable energy, LEAP-RE. It will set the foundation for future collaborative AU-EU activities in the field of renewable energy (RE). The event will be web-streamed to interested parties (link will be available about 48 hours before the event on its website). Please check our webpage regularly: further information (programme, registration, practical information) will be published in the coming period.